Official artwork of Ghirahim from Hyrule Warriors. Ghirahim (ギラヒム, Ghirahim) is a major antagonist from The Legend of Zelda: Skyward Sword. Ghirahim as he appears in The Legend of Zelda: Skyward Sword. Ghirahim first appeared in The Legend of Zelda: Skyward Sword as a mysterious antagonist. A demon befitting his self-proclaimed title "Demon Lord", Ghirahim has a rather cool and flamboyant personality that quickly changes to angry, irritated, psychotic, and remorseless when his plans do not go accordingly. He wields powerful magic, embellished with diamonds that are similar to the ones on his clothing, capable of teleportation, summoning monsters, and even unleashing his true potential. When Link first meets him early in his quest to find Zelda after she falls from Skyloft by a tornado, it is revealed that Ghirahim was the one who stirred up the tornado to kidnap her. Link valiantly beats him, but Ghirahim retreats as he continues to pursue her. Throughout the game, he causes many problems for Link, Zelda, and Impa by taunting and harassing them. The reason for this is eventually explained; Zelda is the physical reincarnation of the goddess Hylia, and Ghirahim was solely after Hylia's divine essence, it being the sole thing capable of reviving his master, the Demon King Demise. Link successfully eradicates Demise with the Triforce in his time, but Ghirahim kidnapped Zelda and travels back in time via the last Gate of Time, returning to a point when Demise was still alive and successfully reviving him. Ghirahim is revealed to be merely the spirit within Demise's Sword, as Link's ally Fi is to him. Link defeats and seals away Demise permanently, Ghirahim's fate as of that point remaining unknown. Ghirahim uses attacks similar to facing him in the second phase of his first and second encounters, in which he uses darts and his signature rapier. These attacks are also used in his Hyrule Warriors appearance. Ghirahim in Super Smash Bros. for Wii U.
Ghirahim appears in Super Smash Bros. 4 as an Assist Trophy. He attacks fighters with both his sword and his knives, and traverses the stage primarily by teleporting. He can be flinched if he's attacked. 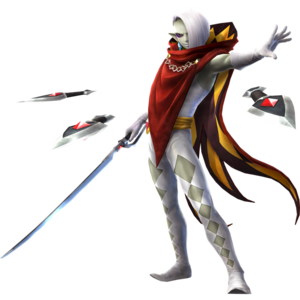 If he is knocked off the stage, he can teleport back; attacks also cannot interrupt Ghirahim's attacks, and he can also reflect any projectiles thrown at him. Ghirahim's trophy appears in both versions. In Super Smash Bros. for Wii U it is part of the Skyward Sword Characters Trophy Box. Link encounters Ghirahim repeatedly during his adventure. Extremely confident, he encourages Link to use his title, Lord Ghirahim, when they first meet. Is he truly powerful, or does he use eloquent words to distract you and gain an advantage? Ghirahim reprises his role as an Assist Trophy in this game. Training Mode describes his Assist Trophy: Throws knives and slashes with a blade, closing in on opponents by dashing and warping. He is also a Spirit. Ghirahim in Super Smash Bros. for Nintendo 3DS. This page was last edited on February 11, 2019, at 23:43.